You play as a rebel ship, controlling its crew as you try to transfer critical data across occupied space to reach the rebellion, so that they can use it to fight back against the encroaching empire. There are a few different races that you can encounter and control along the way, each with a distinct physiology and design that actually do have meaningful gameplay effects, even if they are slight. Each of the eight zones that you have to travel through can be controlled by a different faction, and as you try to pick your path through hostile space, you are forced into making split second decisions that could make the difference between survival and slow but fiery failure. This element is easily the most compelling part of the gameplay. You always have choices within the game, from which direction to go on the map, to whether you should engage with a random even, which weapon to fire, what part of an enemy ship to target, or which part of your ship to repair first. But with each decision, comes a timeline, whether that is obvious or not. Maybe you have to rush through a battle and juggle six different tasks, as you order your crew to extinguish fires, fire weapons, trading energy back and forth between subsystems to try and eke your way through every battle. And sometimes, you have to give up on one of these avenues. Maybe your shield room is on fire and you can’t spare the men to put it out. So you evacuate the oxygen from the room, and hope for the best. 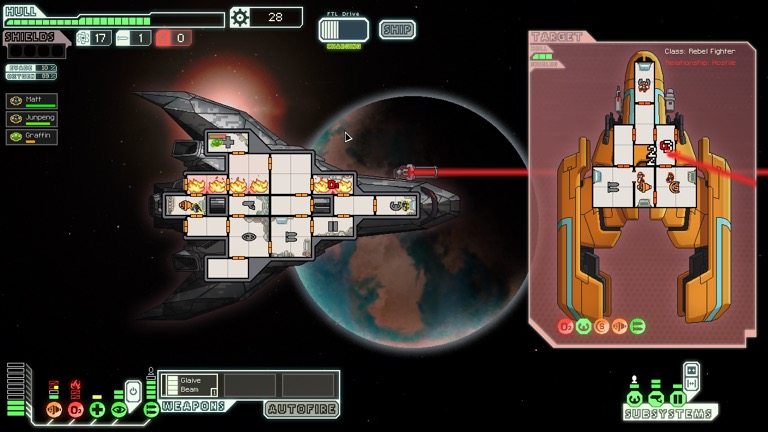 It makes each battle into a frenzied struggle for survival against a steadily ticking clock and rapidly diminishing resources, and this foreboding sense of urgency carries over into the calm moments between fights as you limp your way to safety, trying to repair your ship and get everything back under control. 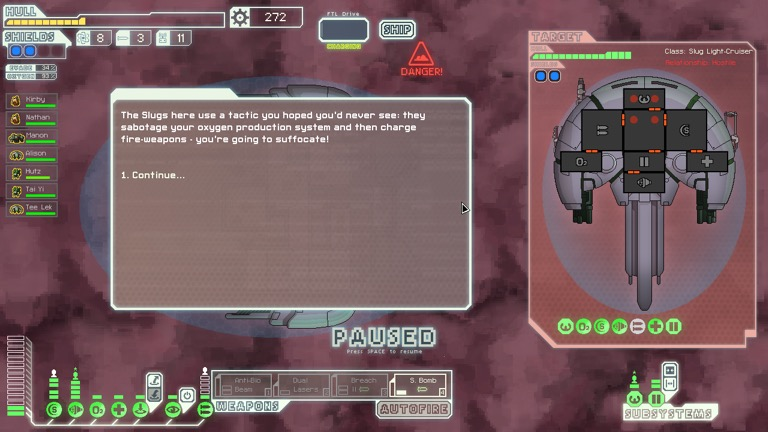 All of a sudden, stopping and shopping for upgrades doesn’t feel so safe, and choosing your next FTL jump on the map could mean the difference between the vital information reaching the rebellion, or all of your friends being killed. Along your path, you have choices that you will have to mull over. You encounter derelict ships, abandoned space stations, limping civilian cruisers, and hostile drones. You can stop your ship and help, but with this act of chivalry comes a risk. You can lose your crew, be ambushed by pirates, or be infected with dangerous space parasites. If you are lucky, nothing bad will happen and you might get some resources or a new crew member out of the encounter, which is a boon in hectic encounters, letting you have one fewer station to juggle people between. Or you could lose your favorite pilot and be hobbled for the rest of your playthrough. The option to say “no” and fly away always weighs heavily in the back of your mind when you view each of these decisions. It would be easier, safer, and smarter to simply walk away from the people who need you. But you don’t want to, whether that is because you are motivated by greed for more resources or by the simple need to help others. And when you listen, it will frequently get you killed, taking away some of your valuable resources, and setting you off on a slow course towards death. But nevertheless, the voice in the back of your head asks you to help them out. When you succeed, you feel good about it, like you’ve done the right thing, and that is a powerful feeling that kept me trying over and over again, even after being punished for it. 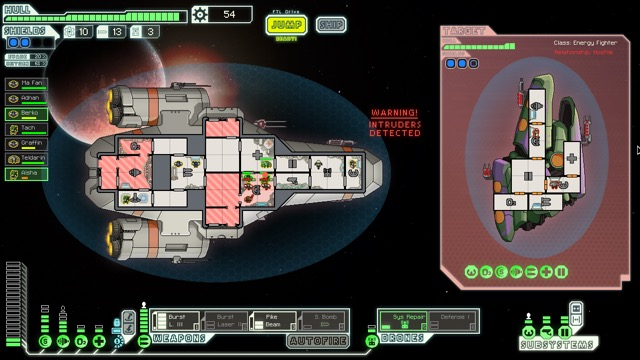 FTL is already a hard enough game, and these challenges only serve to amplify the difficulty. It was a rare sight for me to see the latter half of the game, and for once a roguelike/lite ket itself from paling into the trap of having you search for the perfect run, because no matter how hard you tried, every single time was going to be flawed in some way, and you just had to make the best out of what you had. This feeling, a sole ship limping forward in the face of the empire, is a rather unique one, and it alone justifies playing it.